Here we are at Thanksgiving. It should be a day to reflect on what we are thankful for, to rest and relax before we begin the next holiday season, to spend some quality time in the garden in autumn. But some people won’t rest and relax. They will pull out that big, thick stack of ads that came with the morning paper and start plotting their shopping strategy for Black Friday. Others will jump up from the table after eating and begin pulling out boxes and bags of Christmas decorations, sweeping aside any remnant of Thanksgiving that might have existed for a fleeting minute or two. The Thanksgiving Thumper is a close relative of the Halloween Hare, the Christmas Cottontail, and Bountiful Bunny but feels quite left out of things. He is not happy that many people take down Halloween decorations and immediately replace them with Christmas decorations. He is less than pleased when Thanksgiving is turned into a planning day for Christmas shopping. He feels nearly powerless to change things, but he’s stubborn and will not go away easily. He wants people to enjoy Thanksgiving as Thanksgiving. He wants people to slow down and not get caught up too soon in the frenzy of the Christmas season. - Hide the Black Friday shopping ads. Who needs those deals and those crowds? I can guarantee if you go shopping at your local garden center tomorrow, you’ll find all you need for yourself and family, and there will be no crowds. - Spend some time outside after lunch enjoying the last of autumn by taking a walk, or engaging in more vigorous activities like chopping wood, raking leaves or mowing the lawn. - Eat, eat a lot. Do not diet. The Thanksgiving Thumper abhors those who try to diet on Thanksgiving. - Leave the Christmas decorations in storage until another day. In fact, consider leaving them in storage for several more days, at least until the leftover turkey is all eaten. Happy Thanksgiving to everyone from the Thanksgiving Thumper at May Dreams Gardens. That Thanksgiving Thumper, like his relatives, is very invested in the happiness of the Head Gardener at MDG, it seems. Happy Thanksgiving to you and yours, Carol! I'm with Thumper, all the way! Carol, I wish you and your family a slow and easy and delightful Thanksgiving. Garden bloggers around the world give thanks for *you* and all you do for our online community. I'm in full agreement with the Thanksgiving Thumper. I feel that preparations for Christmas shouldn't begin before Advent...that's why it's called that: "toward the event". Also, the Christmas Season begins on Christmas Day; it doesn't end on it. (Twelve days of Christmas, anyone?) I don't understand people who start taking down their Christmas decorations on Boxing Day. To everything there is a season...let's celebrate the beauty of each season in its turn. Check, check, check on all the above here with one modification. Dinner is after dark, so I got outside for a bit this afternoon to feed the birds. 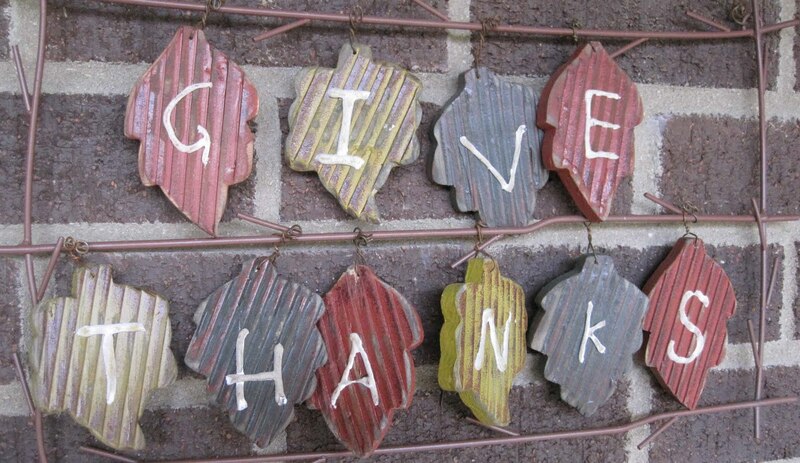 Happy Thanksgiving - it sure is nice here in Canada to have a length of time between this holiday and Christmas. We celebrated Thanksgiving way back on October 12 so can relax and think about pulling out the Christmas decorations - usually about mid November. My Thanksgiving Day doesn't end with the dishes washed and put away; I relax and eat leftovers all weekend. No rushing out for sales. No fighting crowds- I read, and watch television- or Blog. I am delighted to get to meet the Thanksgving Thumper. He would Haredly know it was Thanksgiving here as the Christmas decor was up to entertain the family at Thanksgiving. There were people plotting their Black Friday attack and there were those that got out into the garden to walk off a little of the over indulgences at the table. I could not agree with Thanksgiving Thumper more, well put! I'm lucky because Mr. Mouse has a birthday right on or right after Thanksgiving, so we really focus to do the Thanksgiving-birth-day right, and I'm fretting for those gifts first. Then I celebrate Buy Nothing Day (day after Thanksgiving). I agree with Thumper - no Christmas till the turkey is gone. Here in Canada, we don't have that conflict. But I've always waited until our neighbours to the south finish celebrating their harvest season before jumping on the Christmas bandwagon. Hope you had a great time with family and friend and that your new mower is up to expectations.